GM: Cardinals have yet to make a decision on the No…. 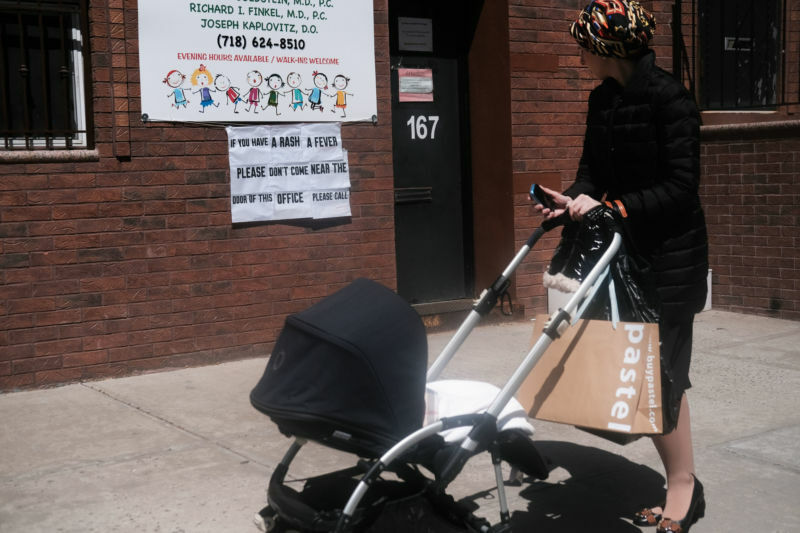 NEW YORK, NEW YORK – APRIL 10: A sign warns people of measles in the ultra-Orthodox Jewish community in Williamsburg on April 10, 2019, in New York City. As a measles epidemic continues to spread, New York City Mayor Bill de Blasio recently announced a state of emergency and mandated residents of the ultra-Orthodox Jewish community in Williamsburg at the center of the outbreak to get vaccinated for the viral disease. Five unnamed mothers in New York City filed a lawsuit Monday, April 15, seeking to block the city’s mandatory vaccination order in areas hit by a massive measles outbreak that has raged since last October. so far—mostly children. According to the city’s order, all unvaccinated people in affected ZIP codes must receive the Measles, Mumps, and Rubella (MMR) vaccine, prove immunity, or have a valid medical exemption. Violators could face a fine of $1,000. In the lawsuit, the mothers claim that the outbreak does not constitute a dangerous epidemic (though the virus can cause severe complications and even death) and that the city’s orders are “arbitrary and capricious.” Moreover, they allege that the MMR vaccine has significant safety concerns (this is false; side effects beyond mild, temporary discomfort are exceedingly rare) and that the order violates their religious freedom. The lawsuit is just the latest example of anti-vaccine parents challenging the legality of public health officials’ efforts to curb measles cases—which are mounting at an unprecedented rate across the United States. As the mothers filed their lawsuit Monday, the Centers of Disease Control and Prevention updated this year’s nationwide measles count, reporting a whopping 555 cases confirmed from 20 states. The surge is largely due to parents in insular communities refusing or failing to vaccinate their children based on misinformation and fearmongering about vaccine safety from anti-vaccine advocates. The 555 tally for 2019 is the second-largest tally since measles was declared eliminated from the US in 2000. (That means that the highly contagious virus is no longer considered to be continuously spreading in the country, though international travelers still bring in cases each year, sparking outbreaks of various sizes.) This year’s tally is surpassed only by that of 2014, which saw 667 cases. In all likelihood, 2019 will surpass 2014’s total—and quickly—given the rate at which cases are being reported and the fact that there are six separate outbreaks still ongoing in the country. Surpassing 2014’s total would make 2019 the worst year for measles cases in the US this century. But anti-vaccine parents have, in step, filed legal challenges to many of those efforts, arguing, as the mothers have, that measles is not dangerous (it is), the vaccine is dangerous (it isn’t), and that the measures violate personal freedoms. Parents in New York’s Rockland County filed lawsuits after health officials there barred unvaccinated children from schools and then filed again after officials banned them from public spaces. The county is facing an ongoing measles outbreak, which has sickened 186, mostly children. Though a federal judge initially denied the parent’s request for an injunction on the school ban, a state judge later halted the county’s ban on unvaccinated children in public spaces. Rockland officials doubled-down on their efforts Tuesday, April 16, issuing two new orders. One bars anyone sick with measles or anyone who has been exposed from indoor and outdoor places of public assembly. The other order cracks down on students who don’t have their immunization or exemptions properly documented. In New York City, Mayor Bill de Blasio said that the city consulted with lawyers before issuing its vaccination mandate and that he feels confident the mandate will hold up in court.